Bring this Safavieh Courtyard area rug into your dining room for an easy splash of style. Keep the contemporary look in your home with this indoor/outdoor piece crafted from plush synthetic material. This machine-made rug will make a bold statement in your home that lasts. Quality and style come first with this geometric patterned grey rug. Courtyard Gaia Light Grey / Anthracite 4 ft. x 5 ft. 7 inch Indoor/Outdoor Area Rug This stylish Safavieh Courtyard area rug is a high quality dicor option. Decor done right with this indoor/outdoor piece, and its plush synthetic material. Keep this machine-made made rug in your home for a long time. 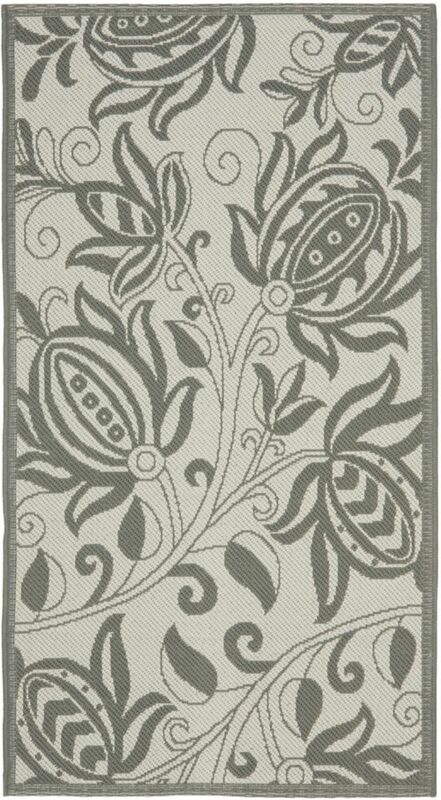 The floral plants pattern on this grey rug is very modern and stylish.